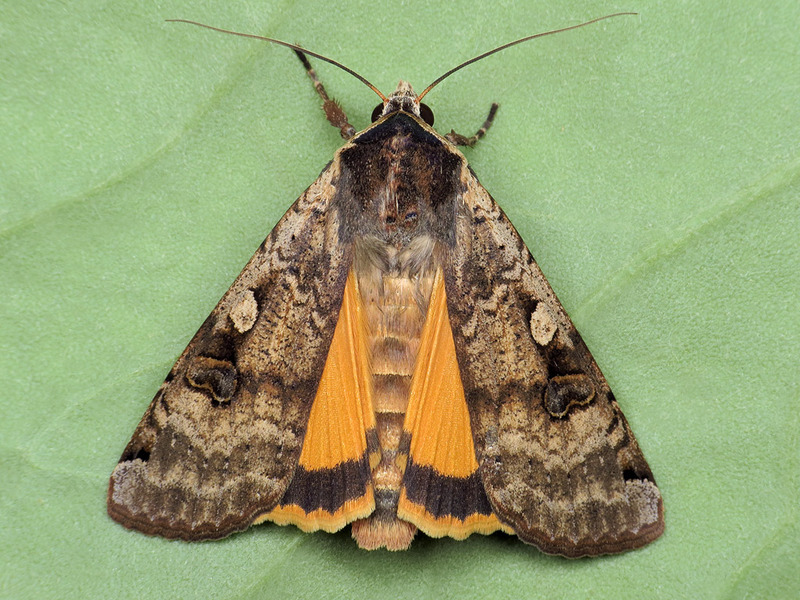 Above is an example (copyright Richard) of the large yellow underwing Noctua pronuba, the most widespread species of its genus. Noctua pronuba is a relatively large moth, with a wingspan of up to 60 mm. The forewings are fairly dull and dark in colour, but the hindwings are a bright yellow-orange (hence the vernacular name) with a black border. It can usually be found out and about in mid summer to early autumn. Its larvae are one of the types of caterpillar known as 'cutworms', which live buried in the soil during the day and emerge at night to feed. They get their vernacular name because their soil-dwelling habits mean that they tend to feed on plants from the base, often toppling small plants and seedlings like a lumberjack taking down a tree. The larvae of the large yellow underwing are not overly discerning in their food preferences; though they most often feed on grasses, they will quite happily dine on other herbaceous flowering plants such as legumes. 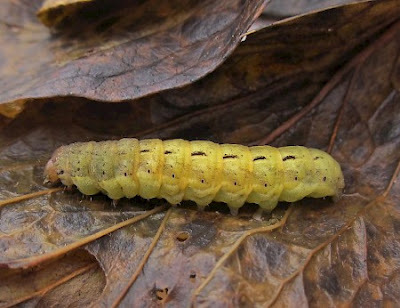 Larva of Noctua pronuba, copyright Nigel Richards. The large yellow underwing is native to a wide part of the Palaearctic region, i.e. Europe and northern Asia. In 1979, it was also found introudced to Nova Scotia in North America. Since then, it has spread rapidly and can now be found over much of temperate North America, reaching British Columbia in the west and Louisiana in the south (Copley & Cannings 2005). The large yellow underwing is a strong flier and is known to undertake significant migrations in its native range. Females may also lay large numbers of eggs at a single time on the underside of leaves or on non-host plant substrates, where they can easily be carried between locales by human transportation. For the most part, a significant impact of the large yellow underwing on native or horticultural production in North America has not been recognised, though a number of authors have suggested that this species' generalist diet may lead to any such impact going unnoticed. The Azorean Noctua atlantica, copyright Jens Jacobasch. Historically, a large number of species have been included at one time or another in the genus Noctua, but a revision of this and closely related genera by Beck et al. (1993) cut it down on the basis of larval and male genital morphology to just two species. The only other species retained in Noctua sensu stricto by Beck et al. was N. atlantica, a species endemic to the Azores islands west of Portugal. Noctua atlantica is somewhat smaller than N. pronuba with duller hindwing coloration. It is restricted in its home range to the laurisilva, a particular subtropical forest type dominated by laurels and other evergreen, broad-leaved trees. Noctua pronuba is also found on the archipelago but inhabits are wider range of habitats. Genetic comparisons between the two species suggest that their populations diverged about five million years ago, a time frame that is not inconsistent with the origin of the Azores archipelago about four million years ago (Montiel et al. 2008). Perhaps an early population of N. pronuba became isolated on the Azores long enough to evolve into a distinct species, followed by a later re-colonisation of N. pronuba from the mainland. This would be similar to patterns seen in my home country of New Zealand, where repeated immigrations from Australia have lead to species pairs such as the endemic takahe Porphyrio hochstetteri and the more widespread pukeko P. melanotus, or the endemic (now extinct) Eyles' harrier Circus eylesi and the modern swamp harrier C. approximans. Beck, H., L. Kobes & M. Aloha. 1993. Die generische Aufgliederung von Noctua Linnaeus, 1758 (Lepldoptera, Noctuidae, Noctuinae). Atalanta 24 (1–2): 207–264. Copley, C. R., & R. A. Cannings. 2005. 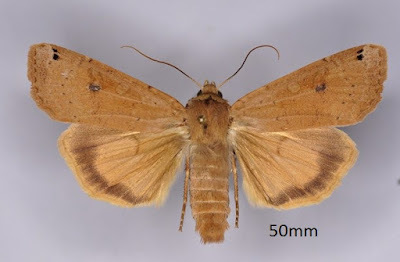 Notes on the status of the Eurasian moths Noctua pronuba and Noctua comes (Lepidoptera: Noctuidae) on Vancouver Island, British Columbia. J. Entomol. Soc. Brit. Columbia 102: 83–84. Montiel, R., V. Vieira, T. Martins, N. Simões & M. L. Oliveira 2008. The speciation of Noctua atlantica (Lepidoptera, Noctuidae) occurred in the Azores as supported by a molecular clock based on mitochondrial COI sequences. Arquipélago 25: 43–48.